It may seem ridiculous to explain how to sleep to someone, but as busy adults with many responsibilities, it can be trickier than one would think to get a peaceful nightʼs rest. Sleep is important and a key part of our overall health. It is when our bodies repair and renew themselves, and our need for those functions does not lessen as we grow older. Try these sleep tips to get a restful night’s sleep and function better during the day. If you have a snack before bed, make sure it is a small one. An over-full stomach can disturb sleep. Some good snack options include – almonds, bananas, warm milk, chamomile tea, oatmeal, and whole wheat bread. Do not do strenuous exercise within the hour before you go to bed, though a few simple relaxing stretches are fine. Limit phone calls, email, or any interchange that might be stressful right before bed. Whatever it is can wait until tomorrow. Make sure your bedroom is cool enough. If the room is too warm, you will likely feel restless. Greatly limit light in the room. With all the electronic devices we have today, each with its own little glow, it is easy to end up with more light in the bedroom than we mean to have. Our bodies do not produce melatonin (the sleep hormone) if there is too much light. Leave devices to charge in another room. Spend 5 – 10 minutes reading your favorite peaceful selections – whether it is meditation prompts, devotions, poetry, humor, or something else. Take this important time to prepare your mind and body for rest. If your mind is still “busy,” try some white noise. A special gadget is not required. iTunes has many options for white noise, such as waterfalls or mountain rain, that are affordable and can help lull you to sleep. If you’re thinking, “Well, these sleep tips are all nice, but I don’t have time to do those things each night.” Remember this – the you that you bring to your family, work, and every single interaction the following day will be better if you are well rested. 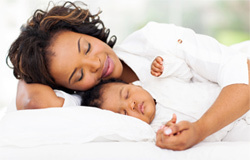 Also read Dr. Sears’ sleep tips on how to get your baby to sleep as well as you do! Diane Yelich is a certified health coach with the Dr. Sears Wellness Institute. A passionate teacher, she switched her focus after 10 years, from elementary school to teaching adults about the 4 pillars of health: lifestyle, exercise, attitude, and nutrition. Another facet of her teaching is an cardio-fusion class she leads at a local senior recreation center. Diane has 3 grown children and lives in Atlanta, Georgia. Through her business Nutrition Know-How, LLC, Diane shares her knowledge and enthusiasm to help empower others to create the lives they desire. Her website is www.healthyleanlifestyle.com. Email her at nutritioncoachD@gmail.com.